Last week, I wrapped up an intense project here at the Center for Cartoon Studies. 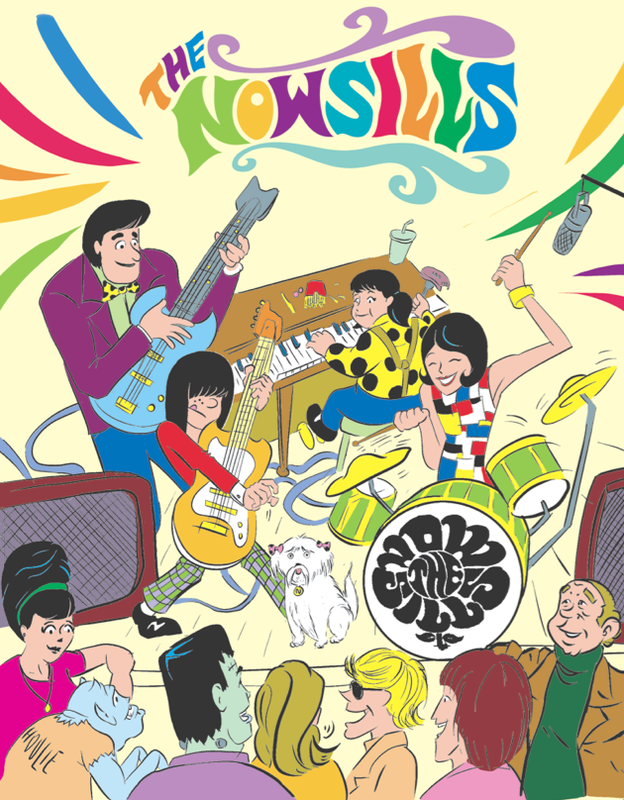 I , along with 5 collaborators were to time travel back to 1966 and create a teen musical comedy that abided by the Comics Code and that would sell like hotcakes, knowing what we 21st century cartoonists knew about the medium. I had the privilege of working under the invaluable editorial guidance of Steve Bissette with fellow students Simon Reinhardt, Eleri Harris, Ben Evans, Alexis Dexter and Aaron Shrewsbury. It was a doozy of a project, but everyday was a genuine pleasure to work with these folks. Here’s a peek at the cover that we came up with for this 32 page issue of the Nowsills! I’m really proud of the work that we all churned out. Right now, I’m trying to ready the files so as to have something that I can send to an offset printer to genuinely print these bad boys in conjunction with my collaborators. Once that’s ready, I’ll certainly have something that will be easily readable online for your perusal, AND something physical for you to purchase. Given the intensity of the above mentioned Silver Age assignement, you might see some of the stress slip into some panels. Let me know what you think and if there’s anything that you’d like to see me tackle in the coming weeks dailies.